Impressive displays by some of the world's best military and civilian pilots drew thousands of spectators at the weekend to the Royal Naval Air Station (RNAS) Yeovilton International Air Day. This year the theme was the 30th anniversary of the Falklands War, when in 1982 over 1,400 personnel and 126 aircraft from the base deployed to the South Atlantic, and visitors were able to see some of the aircraft that took part. Following on from 2011’s award-winning event, the 2012 show was once again an outstanding success, showcasing the Fleet Air Arm with a comprehensive five-hour flying display, plus a diversity of static displays. The traditional Royal Marines Village, supported by the Commando Helicopter Force, was one of the crowd-pleasers, allowing spectators to get up close and personal with the current military vehicles, the aircraft on show and the sailors and marines who operate them. The Royal Navy Historic Flight, celebrating its 40th anniversary, provided powerful reminders of the Service’s achievements during the Second World War and the immediate post-war years, with displays from the Fairey Swordfish LS326 and the Sea Fury T20 - a two-seat trainer version of the most potent piston-engined fighters ever built. 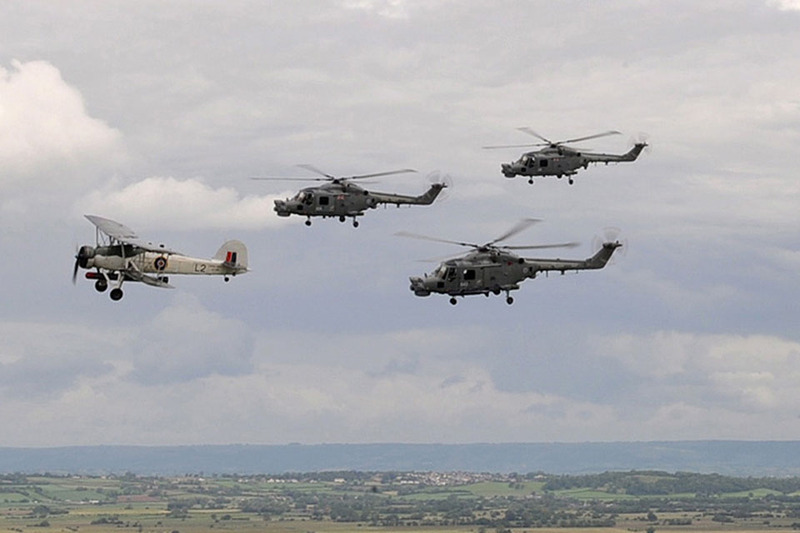 Royal Navy contributions also included the award-winning Royal Navy Black Cats Helicopter Display Team, who put their two Lynx helicopters through their paces in an intricate, fast-paced and newly-choreographed routine. There’s a thrill performing in front of your home crowd. We do many flying displays around the county during the season but Yeovilton is special. Unique to the Yeovilton Air Day was the Royal Navy’s spectacular Jungly Commando Assault. 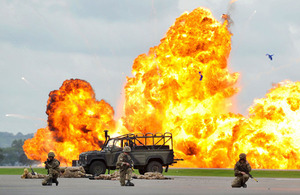 A multi-layered role demonstration, blending flying assets, armoured vehicles, troops and explosions in an all-action set piece that illustrated the vital contribution to the preservation of global stability made by the Royal Navy both 30 years ago during the Falklands War and the present day. Also on the ground in the specially designed arena were the exciting field gun competition between HMS Heron (RNAS Yeovilton) and their rivals HMS Seahawk (RNAS Culdrose), and a Band of Her Majesty’s Royal Marines, fresh from their recent involvement in the Queen’s Diamond Jubilee Pageant, performing to the obvious delight of the public. But the really big showstopper for 2012 was the sight of one of the largest aircraft in the world. A Russian Antonov An-124 displayed for the first time in over two decades, adding that ‘wow factor’ to the skies above Somerset. Air Day at Yeovilton is all about involving the whole family. This year we enlarged the Royal Marines Village to include a greater range of combat vehicles and aircraft. The Antonov was so very impressive it almost took your breath away. There’s certainly been something for everyone this year. RNAS Yeovilton is one of the Navy’s two principal air bases, and one of the busiest military airfields in the UK. It is home to the Lynx Helicopter Force and the Commando Helicopter Force, with more than 100 aircraft operating on front line squadrons and training units, plus the legendary vintage aircraft of the Royal Navy Historic Flight. The base is located near Yeovil in Somerset and covers around 1,400 acres (5.7 square kilometres), with the main airfield in Yeovilton itself and the satellite at Ilton (Merryfield). Some 4,300 personnel, Service and civilian, including MOD employees and permanent contractors, are employed on the base. In addition to the squadrons, the air station is home to the Navy’s Fighter Controller School, the School of Aircraft Control and the Helicopter Underwater Escape Trainer.